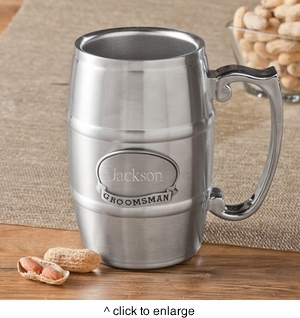 DETAILS: Stainless Steel bodied mug with a plastic handle and personalized with a Pewter Medallion. Select your desired medallion type: Groom, Groomsman, Bestman, or Usher. Holds 16oz of a special frothy wedding tonic or the Groomsman's favorite ale. Personalize with a customized message consisting of 2 lines and 15 characters. PERSONALIZATION: 2 lines up to 15 characters per line. Choose Medallion type.